With Irish Design Week kicking off this week, we at artysmarty, decided to keep you updated with our favourite events of the week. The festival is based on events submitted by anyone involved in design so there’s a fabulous mix of talks, exhibitions, clinics, debates, launches etc… you get the drill. So, whether you want to pack in the whole week, or even use your lunchtime hour, there’ll be something to suit design and craft fan. On Tuesday evening, we went along to a launch and talk entitled ‘Textile Architecture’ at the Royal Institute of the Architects in Ireland on Merrion Square. 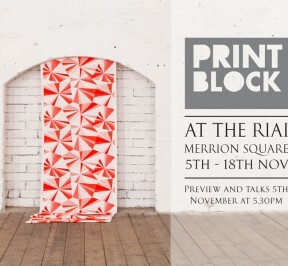 The event marked a collaboration which saw Printblock, Dublin’s textile print collective creating a series of site specific prints for the magnificent Merrion Square headquarters of the RIAI. Before the official opening, we were greeted to a series of fascinating and informing talks on the subject of from several speakers including our favourite Olga Tiernan from Printblock and Trish Belford, co-founder of the Tactility Factory, an innovative concrete textile company based in Belfast. Afterwards, while sipping a glass of wine, we got to explore the entire Georgian building, of which nearly every room was draped with beautiful screen prints from the core members of Printblock. The show is open until the 18th of November and well worth a visit. We’ll be legging it out of the studio every evening this week to catch some of the wonderful events, we will, of course, keep you updated. If you want to have a gander yourself, a full list of design week events can be found on their website www.designweek.ie.